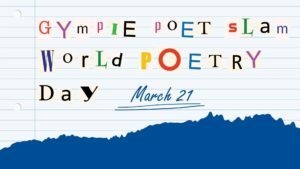 Celebrate World Poetry Day and submit a poem to be read by yourself or a staff member. You can win a prize! Visit Gympie Library 3.30pm-4.30pm on Wednesday 21 March. Children and adults are invited to grab an entry form from Gympie Library and submit it with your poem for a poetry recital with a difference. You can choose between submitting your poem to be read by library staff or perform it yourself. Poems must be no longer than two minutes when read. Prizes awarded to performers on the day; best giggle, bravest child award, and people’s choice award.